Food, Glorious Food… | Keep It Up, David! And boy, did I need it. My cupboards were bare. My fruit bowl was nearly empty, except for a couple onions. I was running low on major meal components, like veggies and proteins, and I was completely out of many of the condiments and pantry items, like mustard and canned beans, that I use to flavor and spruce up my meals. This was my first big shopping trip of 2014. I’ve had a few mini shopping trips, to buy a few items to last a day or two, but I was in dire need of a major restocking. The most important reason being: I like options. If I don’t have healthy options in my refrigerator, than I’m more likely to go elsewhere for food, and that food is more likely to be unhealthy. And I’ve definitely leaned towards the unhealthy in the past week. I haven’t taken a swan dive off the deep end, but I’ve eaten junk food (including the dreaded caramel creams that I wrote about it December), and I really want to rally around eating wholesome, balanced, healthy meals. In December I got within a few pounds of my all-time lowest weight, and thanks to the holidays, I slid a little bit in the wrong direction. I’m not beating myself up over that little gain, but I would like to reverse course. I like losing so much more than I like gaining. And it’s easier to lose when you’re stocked with lots of healthy options. This ended up being a two-store excursion. One grocery store wasn’t enough! The first stop was Trader Joe’s. 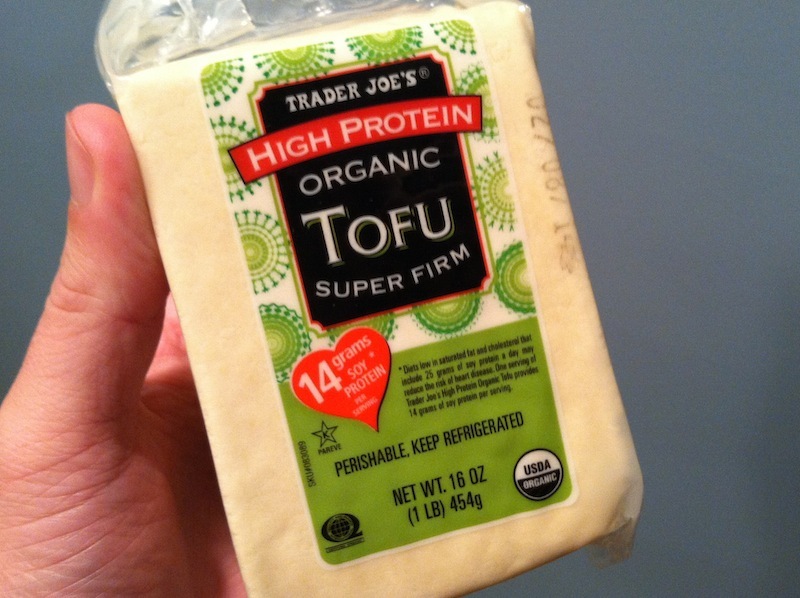 Trader Joe’s is a wonderful store for many things, but I’ve never shopped there exclusively. I don’t love their produce section on the whole (although it has improved a great deal since I first moved to California), but I do love that they have a lot of washed, trimmed and ready-to-eat veggies. The second stop was Sprouts, which has my favorite produce section in town. Great prices, lots of variety, with lots of specialty products and things to discover. All of this is from Sprouts: blackberries (77 cents a container! 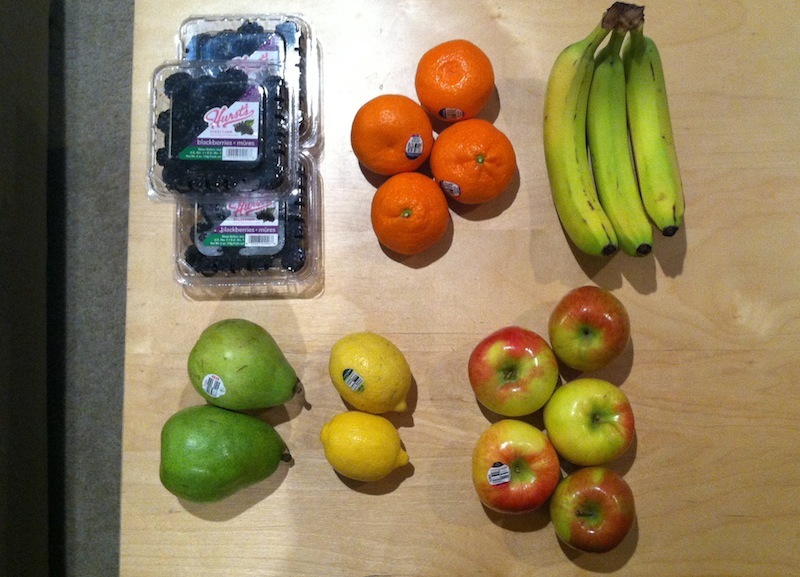 ), tangerines, bananas, pears, lemons, and a mix of honeycrisp and braeburn apples. I just realized I got charged as if they were all honeycrisp, which was the pricier of the two. Ugh. Because I’m on a smoothie kick, I also bought frozen strawberries and cherries (not pictured). All the bagged items are from TJ’s, and all the loose items are from Sprouts. 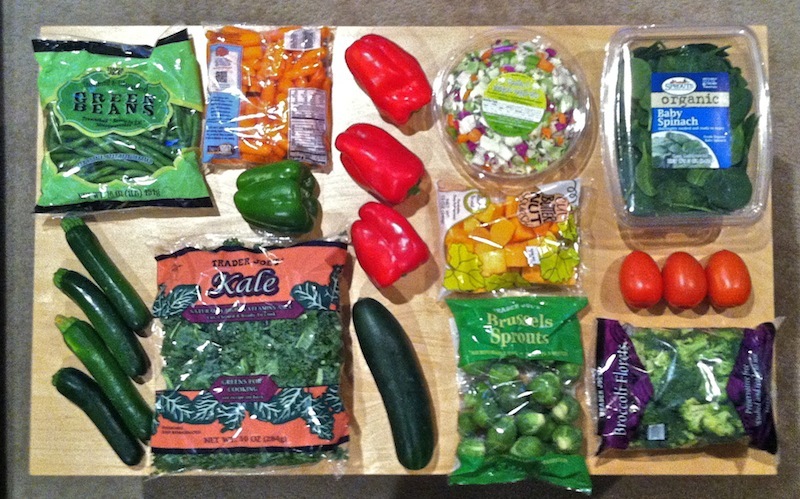 From left to right, column by column: Green beans, zucchini, baby carrots, green pepper, kale, red peppers (3 for $1! ), cucumber (50 cents! ), TJ’s healthy eight chopped veggies, butternut squash, brussel sprouts, spinach, roma tomatoes, broccoli. It’s been months since I shown my produce hauls like this. The last time I did this was after I checked out Sunland Produce in August, but I was lazy and just photographed the items in my shopping cart. Produce hauls are fun! I was on a kick about a year ago where I was going through two of these containers a week. They’re delicious, low in calories and fat, and a great protein source. The only problem is that they have a short shelf life, but I actually don’t mind that, because it means that they aren’t loaded down with salt or preservatives. I discovered the frozen fish section at Sprouts, where they have single-serving pouches of fish – fantastic for a single guy like myself! 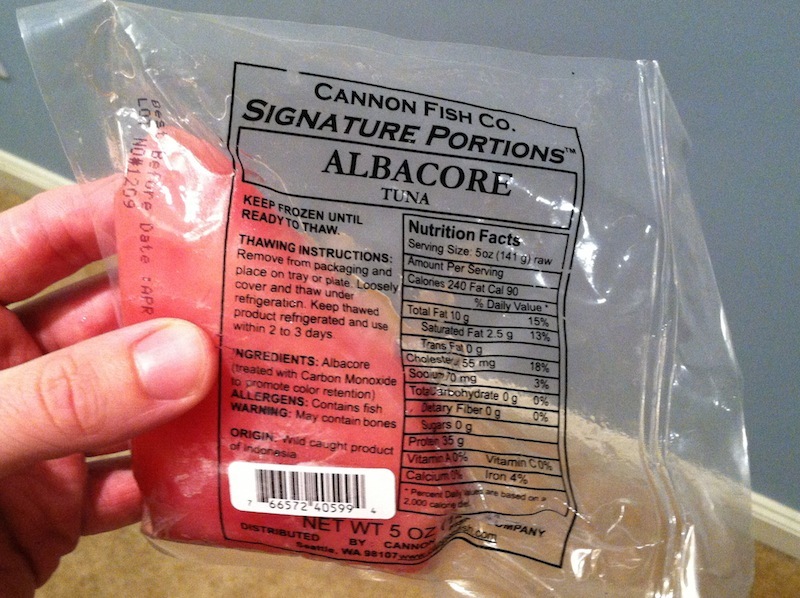 Albacore tuna was on sale, so I picked up two. A five-ounce tuna steak for $4. Not bad. They also had a fish called wahoo on sale, also for $4, so I picked one of those up, too. I don’t think I’ve ever cooked or eaten wahoo, but it’s a steak-like white fish. I’ll have to do a little research on that one. 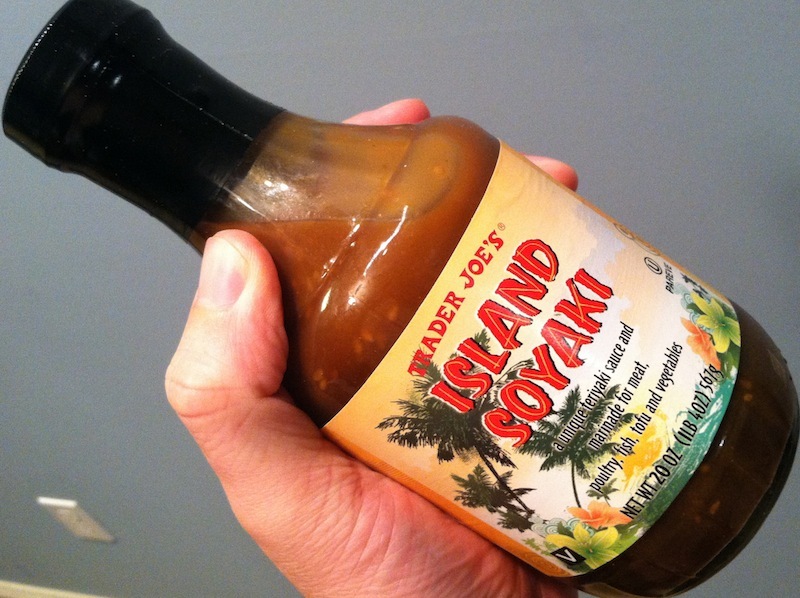 It’s a teriyaki-type sauce and marinade, and it’s pretty low in fat and calories, so I thought I’d give it a whirl. And there you have it. A fully-loaded kitchen. I’ll try to be good about photographing and blogging about what I do with some of this stuff. This, though, is certain: thanks to all this shopping, I’ll definitely be good about eating healthy! This entry was posted on Thursday, January 9th, 2014 at 12:18 am and is filed under Uncategorized. You can follow any responses to this entry through the RSS 2.0 feed. You can leave a response, or trackback from your own site. David: Thank you so much for posting this visible list of the food that is helping you. It is soooo nice to actually see what you buy that helps with weight and health. I will probably copy a lot of your items when I go shopping next. I have also read your posts with great interest in your weight loss journey and really admire your strength to carry on your health quest. You are certainly a great inspiration. …..Dianne. Thanks for the great comment, Dianne – and KEEP IT UP! Thanks so much for taking the time to photograph your shopping spree. You have certainly inspired me to eat healthier. I will be anxious to get some ideas on what you did with all of it. I started eating sweets again during the holidays and I do not want to keep that up! You’re welcome Molly! Good luck to you! I’ve been into eating sweets again for months now too & I have to stop! I liked being able to see what you bought on your shopping spree. Is Greek yogurt the very best choice for low/no sugar,low fat? There are so many choices out there & I’m still stuck on the fruit included kind & know there’s too much sugar in those. You can find nonfat plain yogurt, too – I prefer Greek because it’s a little thicker. It’s a preference thing. Have you tried buying plain yogurt and mixing in a handful of fresh berries or some chopped up peach or banana? You get that same yogurt and fruit punch but without the syrups and artificial sweeteners. I’ve eaten fresh salads for lunch everyday for years! NOW I can’t stomach the thought of eating it, any suggestions? Hmmm… I’ve gotten worn out on salads in the past, too… try wrapping up veggies in a wrap or pita and making a sandwich? Or blend your greens up in a green smoothie? (Like in this post) Or leave out lettuce, and stir-fry the other veggies? There’s lots of non-salad lunch options! Thank you, what smoothie do you recommend? I don’t have a go-to smoothie recipe, because I never make the same smoothie twice. Mine tend to have spinach, a mix of frozen fruit and fresh fruit (adding frozen fruit means you don’t need to add ice), milk or yogurt, and protein powder. Give or take an ingredient or two. Thanks for suggesting spinach in a protein smoothie I will try it?! 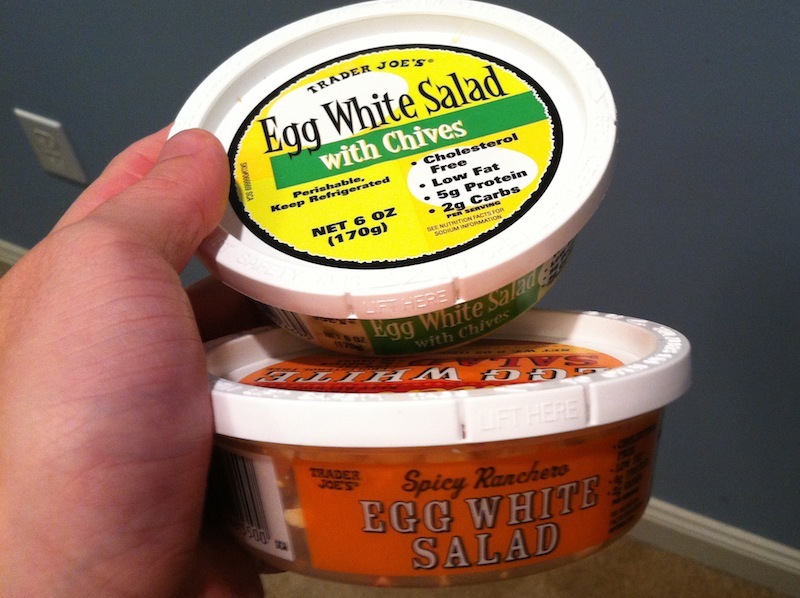 Thanks for introducing Trader Joes egg white salads! On my list to try!!! They’re great! You’re gonna love them. So glad I found your blog… I am on Take Shape For Life a Medfast fueled program.. So far down 51 pounds with about 22-25 to go .. Loved looking at your grocery haul.. Gives me ideas for my lean and green meals… Thanks!!! You’re welcome. Congrats on the 51 pounds… keep it up!